Flying out of his home base in New Jersey and headed south is airline transport pilot, Matthew Kiener in his Piper Saratoga. But this is not your ordinary flight, on his way home Matthew will have a special package – dogs! Matthew is the founder of FlyPups, Inc., an organization that transports at-risk dogs in high kill shelters and matches them up with a rescue or non-kill shelter in the north. 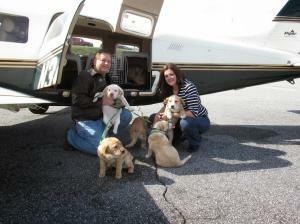 FlyPups has flown thousands of miles rescuing hundreds of puppies and dogs from being euthanized. FlyPups has recently teamed up with an organization that trains dogs for service to veterans. Their fist trip brought eight potential service dogs from Florida to Pennsylvania. FlyPups is excited & honored to be in a position to give back to those who have served our country so heroically. Aviation Insurance Resources (AIR) knows the importance of the work at FlyPups. That is why each year we shop Matthew’s insurance with all the aviation insurance markets to ensure he is obtaining the best rates and a policy that fits his needs. We save Matthew time and money so he can focus on what he does best: giving shelter dogs a second chance. FlyPups motto is: “Where dogs find hope, and people find friends.” On Mathew’s first dog rescue flight, he found his forever friend in a beagle mix he named Piper. 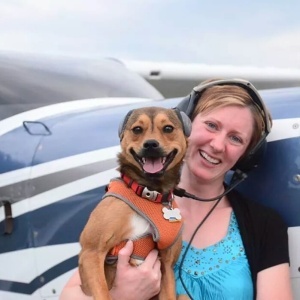 AIR agent Victoria Neuville Zajko also found her four legged co-pilot through aviation. Victoria and her husband, Bob, rescued their dog Turbo in 2012. They flew to West Virginia in their Glasair to pick him up and Turbo has logged over 75 hours flying along with them ever since. He has been to Canada, the Bahamas, and many points in between. Turbo quickly took to flight and his story inspired Victoria to write one of her own. With co-author Kelly Kennedy and illustrator Michelle Zajko the Turbo the Flying Dog children’s book series developed. Promoting animal rescue and teaching kids about aviation, Turbo the Flying Dog is best for children ages 4 to 8. Book two, Turbo Learns to Fly¸ will be released June 13th. Take to the skies with Turbo the Flying Dog in his book series or follow his real life adventures on Facebook, Instagram and Twitter! You can order his book at Amazon.com or on TurbotheFlyingDog.com. While you’re there, check to see if he’ll be flying to an airport near you! Whether it’s flying with our pooches or flying with our friends, all agents at Aviation Insurance Resources (AIR) share an immense passion for aviation. We’d love to hear about your special aviation missions or favorite furry co-pilot! To get a quick aircraft insurance quote, complete our online form or call us at 877-247-7767 today! If you are looking to learn more about AIR visit us online at www.air-pros.com today!